CANNON BALL, North Dakota -- Labor Union workers -- nurses, public defenders, pipeline workers, and teachers -- arrived at Standing Rock Camp to support the water protectors and bring a halt to the Dakota Access Pipeline construction. Marty Goodman, retired transit worker, from Manhattan in New York, said transit workers identify very strongly with the struggle. "We're fighting pipelines in New York City." Union workers came from Cheyenne, Wyoming; Casper, Wyoming; Kansas City, Missouri; Madison, Wisconsin; Lafayette, Colorado, and elsewhere came to defend the water. They said, "Water is Life!" A registered nurse from Lafayette, Colorado, said the leader for the AFL-CIO Richard Trumka, had spoken out in support of DAPL -- but union workers did not have a voice in Trumka's decision to promote DAPL. In Colorado, they are fighting fracking and fighting for the water, he said. "If workers can put that pipe in the ground, then they can take that pipe right back out and put it on the truck and ship it out of there." 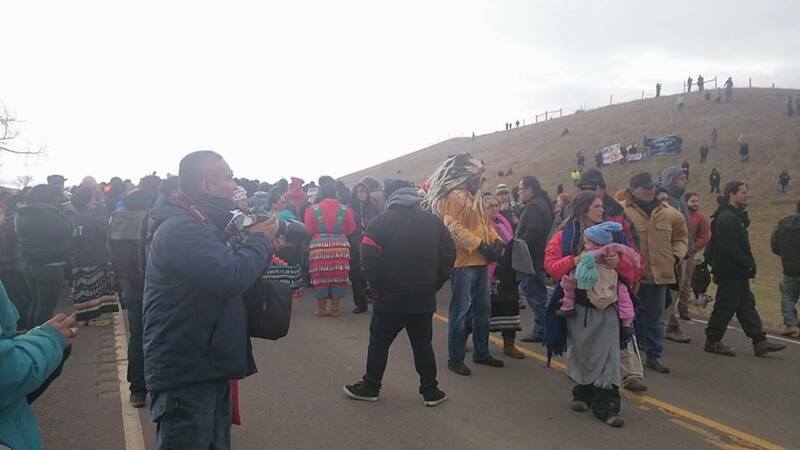 A public defender, with Labor for Palestine, and Labor for Standing Rock, spoke on the vicious attack here by police on unarmed peaceful water protectors. He said what is happening here reminds him of the Civil Rights struggle, Wounded Knee, Palestine, Ferguson and other struggles. Most of all, he said, it reminds him of Palestine. 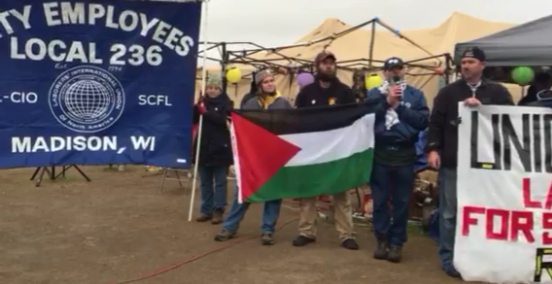 Labor for Palestine, Labor for Standing Rock arrives! Saurday noon. Photo by Marshall. 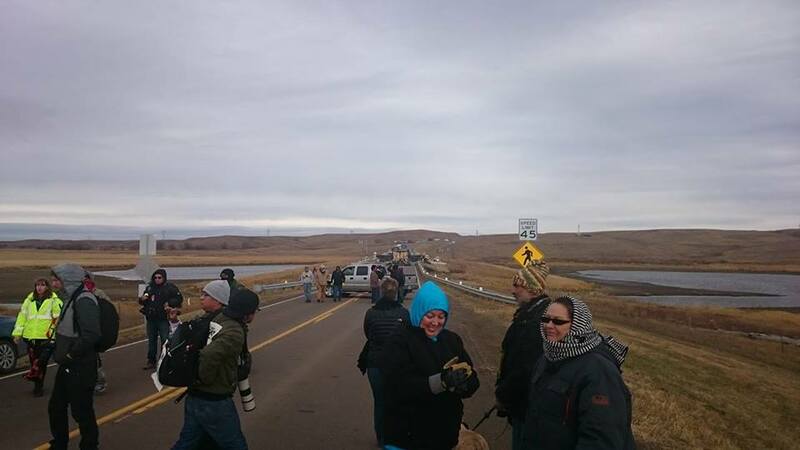 Saturday, Oct. 29, 2016 -- Breaking News: DAPL workers are laying razor wire on the Sacred Sites they bulldoze in the hills east of Highway 1806 as they near the Missouri River with Police Armored vehicle cover! Share! Confirmed with my own eyes. DAPL will have the pipeline complete up to the river in 5-7 days if nothing changes! Calling all Water Protectors! -- Johnny D.
We must defeat the Dakota Access Pipeline! Saturday about 1:30 pm -- Live reports now that water protectors will be going in for their teepees. US Border Patrol, which constantly abuses Indigenous on the border, is now there with highway patrol. Morton Co. Sheriff says he will be there when people retrieve their teepees. Great to see this. Thank you for the video. Brenda is being censored on Twitter. I had to tell folks to google "Censored News" and look for the video. If You Are a Rock, Stand Up Like a Mountain. For months, people have gathered to fight the Dakota Oil Pipeline that will cut through sacred Native American land. This is life at the Sacred Stone Camp. 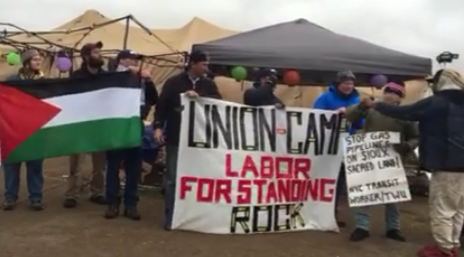 Labor Union workers arrive at Standing Rock Camp to support water protectors from New York, Kansas City, Madison, Wisconsin, elsewhere. They are saying, "Water is Life!" 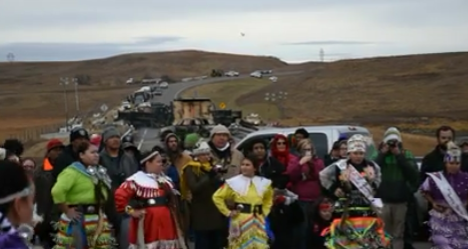 Indigenous Life Movement's live video. "We're Not Protesters, We Are Land Protectors"
Come to Standing Rock, be with the rainbow... all colours of LOVE and RESPECT. Shailene Woodley on being arrested protesting the Dakota Access pipeline, charged with a misdemeanour and strip-searched at the Morton County jail. Woodley is slated to stand trial in North Dakota on January 25. DAPL security shot AR-15 at Protectors. BIA arrested the shooter. This was a medic who was at the front lines. He told his story to us, this interview speaks for itself. The cops actually pulled medics out of their vehicles and arrested them. They had their red cross insignias on their cars, shirts and arms. They are unbiased, they were there to help ANYONE in need. We are still on stand off with riot police. Things are looking bad here. It's time for the US to have a general strike in the US to bring our super-predator "representatives" to heel. There hasn't been one since 1934, and where better to start than Standing Rock? Thank you for the update and to all the union workers! Workers need clean & safe water too. actually North Dakota is being destroyed by all of the poison from drilling wells. Its RADIOACTIVE!! Pipeline companies don't employ that many people anyhow its working against their own future. Coal workers have to fight against the companies for safety. And get paid & then the companies charge high food & rent so they take your pay right back. The workers know how to get jobs done and everyone needs pay but at what cost? Workers die earlier & get injured often. There is less & less concern for workers as human beings; workers are a commidy, a way to make money with spending the least amount. Different types of work can be made. Thanks to Sacred Stones & camps for praying for & helping the workers too. Truth is being censored. Oil & Gas Commission in ND is supposed to regulate drilling & production of oil & gas.LMAO. 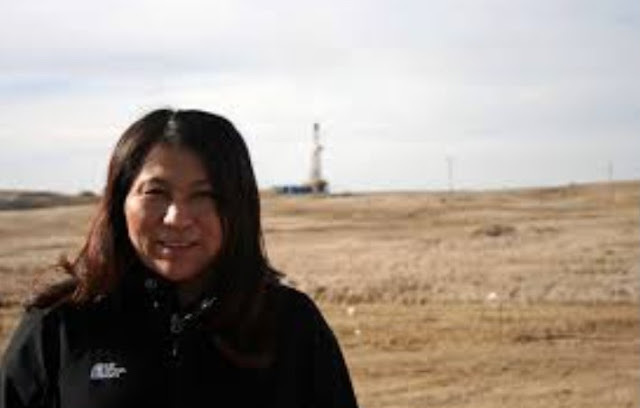 The nightmare of North Dakota:Poisoned Land & Water. Radioactivity doesn't just "go away". Rights of mineral owners take over farms. As the oil boom is over Who Cleans up ? Where do the oil boom workers get employment now? 950 TONS of RADIOACTIVE WASTE found in oil well Landfill ordered to be taken out of state, WHERE was it taken to? What is a picocurie? Measure of RADIOACTIVITY. LANDFILL had between 5-80 picocuries. 5 is the limit! !